Students in Rider’s chapter of the Small Business Institute (SBI), ranked in the top 10 at the national SBI’s undergraduate consulting project of the year competition on Dec. 15. Former class of 2018 undergraduate students David Ferrao, Nicholas Chiarolanzio, senior arts administration major Michelle Belain and entrepreneurial studies graduate assistant Francesca Karpicki, were a part of the group that led the organization to the top 10. Rider was ranked fifth in the nation, according to Karpicki. SBI centers on learning about business operations through experience, including an annual competition to test each university chapter’s consulting abilities. “We competed against many schools, some of which include California State University, the University of North Carolina and the University of Central Florida,” Karpicki explained. Each university chose a client, a small business, to consult and solve problems that pertained to a certain business. “I am glad SBI’s vision is valid even today — it nicely dovetails with [the] university’s statement of vision as ‘going beyond classroom learning to real world experiences,” said professor of strategic management and entrepreneurship, Radharao Chaganti. Rider’s SBI chapter is part of a national organization that is dedicated to providing team consulting experience and entrepreneurial skills, according to the SBI’s mission statement. Rider has a history of winning the SBI Consulting Project of the Year, a national competition. Since 1998, the group has had 32 top 10 rankings in the project of the year competition, according to rider.edu. These students, along with Associate Dean of Graduate Programs, Ronald Cook chose Spruce Industries, a business located in Rahway, New Jersey that provides sustainable janitorial products and cleaning supplies, as their client for the competition. The project consisted of a final written report that was presented to the small business. “I think [the competition] shows how much we are taught here at Rider. We were given three months to learn the ins and outs of an industry none of us were familiar with and to make a plan on how to best solve an issue that even the client, who is extremely familiar with the industry, wasn’t sure how to solve,” Karpicki expressed. Prior to the competition, an annual conference is held and the university chapters enter their consulting projects for the competition. The scores are then ranked by judges. Schools are judged on a 100-point scale and in the categories of problem definition and analysis, definition of the problem and key issues, qualitative and quantitative and analysis of company and industry, according to the SBI’s website. 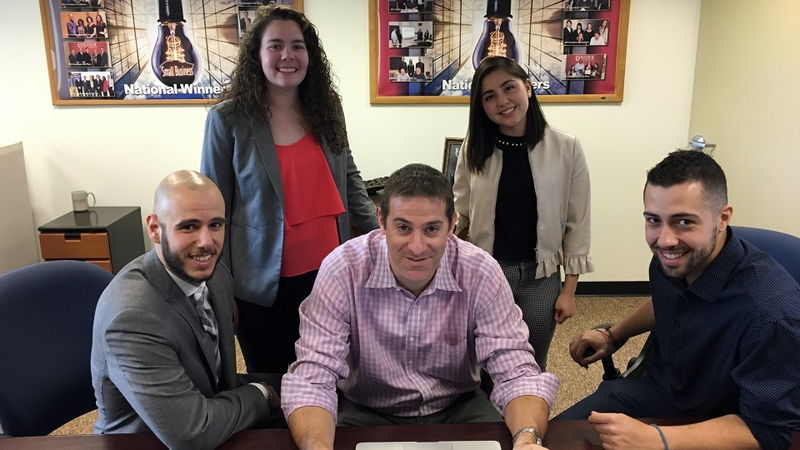 Francesca Karpicki,’18, senior arts administration major Michelle Belain (left to right standing), Nicholas Chiarolanzio, ’18 (left sitting) and David Ferrao, ’18 (right sitting) surround their Spruce Industries client, Dan Joseph. (center sitting).